Jakey is 2 and a half. It's such a fun age, because he's exploring language, excelling physically, and trying new things all the time. And every bit of it excites him as much as it excites us (all FOUR of his proud "parents," because I have to include Nathaniel and Nicholas and their pride in his accomplishments). Sometimes I can't believe the "adult" things he's picked up from us. Night before last, we went to IHOP for supper, because we were all craving breakfast food (and one of us was craving a waitress instead of the "opportunity" to make pancakes at home). When the waitress came to take our order, Grayson went first, and then she asked about Jake. And he ordered for himself: "chocka-cheep puncakes." It didn't occur to him to allow one of us to order for him. He even pointed right to it on the menu so there wouldn't be any mistaking what he wanted. When the waitress brought him a refill on his "Shuh-lee Tipple" -- um, yes, they do serve Shirley Temples at IHOP in case you didn't know -- he said, "Tank yoo" to her. She was completely under his spell by this point. And when she brought our check, she said, "Y'all have a great night, OK?" And Jakey shot back, "Yoo too!" Which completely did her -- and me -- in. While he's showing all these signs of growing up, he's still such a wonderful mix of baby and toddler, too. Cut to our house later on Sunday night, when we were getting ready for bed. 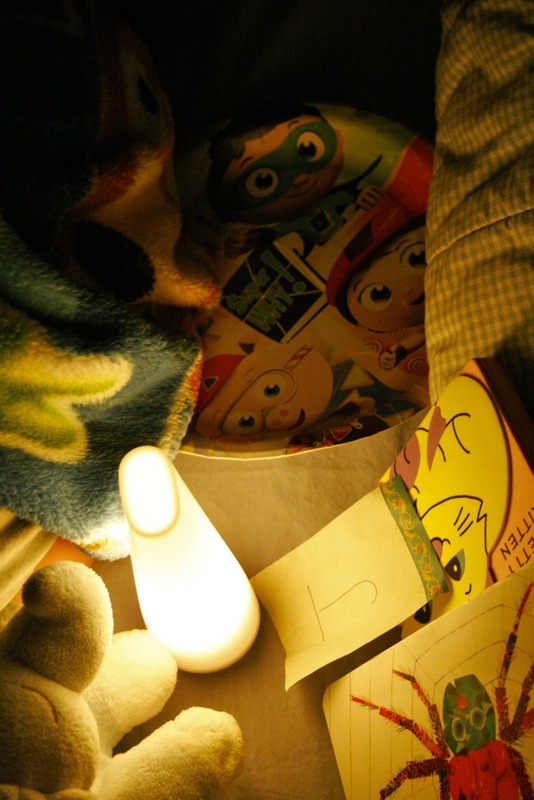 He asked to sleep with his "new Supah Whah" plate, which is a paper plate with the Super Why! characters on it. He's obsessed with the show itself AND the plate, which really should be in the trash but which I really couldn't bear to take away from him at bedtime. PUSHOVER. I know. But he's my BABY. He also insisted on sleeping with what he calls "My J," which is the letter J. He's been taking this little slip of paper with a handwritten J on it to bed with him for several nights now, because he just loves the letter J so much. HAVE. YOU. EVER? I know. I'm dying, too. Ohmygoodness. I want to bury my face in his little neck right now. What a perfect way to start my day! Tears in my eyes, a big grin on my face...so sweet! So sweet. He will be such a little gentleman. I've said it before and I'll say it again - your kids are too precious. I love that little Jakey. I'd like to officially adopt him, please. Thank you. CAN'T. HANDLE. THE. CUTENESS!!!!! So adorable!!! (my comment posted twice for some reason.) Sorry! I'm going to go all teacher now....but, what a dream!!! Love it. All of those social skills are so important and help make the transition from day-care to pre-k to k so smooth. You would not believe how many students come to K and cannot articulate what they want/need, etc... I love this! Like I've said before - would love to have your sweet, smart, and energetic boys in my class! I appreciate everyone indulging me, especially since there weren't even any pictures of his cute face. Amy -- a hand-drawn ladybug?? Too cute! Lacy, did you get that stupid "Blogger Not Responding" error? That thing has been driving me nuts for three weeks.